Update: The Amazon listing has now been removed. On the Amazon Canada website, a listing for Tom Clancy’s Splinter Cell 2018 has appeared. It was first spotted by a Reddit user and the listing is still live on Amazon as of this writing. If the listing ends up coming down, we’ve taken a screenshot for posterity. 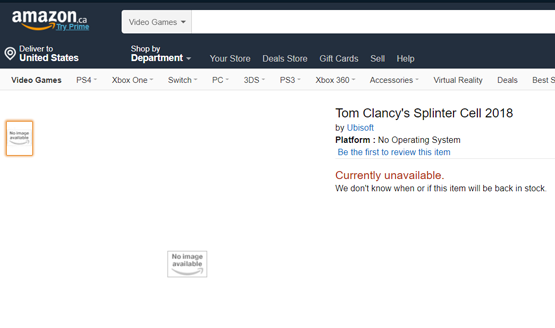 The Amazon page simply lists the game as Tom Clancy’s Splinter Cell 2018 by Ubisoft, with no additional details. Release date, product description, and even platforms are all left blank for now, and there’s no placeholder image yet. While there’s certainly a chance that this is just a fluke listing by Amazon that has no bearing on Ubisoft’s release plans, a number of previous reports have placed evidence that a new Splinter Cell game was in the works. Back in 2016, it was reported that Michael Ironside, the actor who portrays Sam Fisher, was at Ubisoft and confirmed he was working on the next Splinter Cell game. Then at last year’s E3, Ubisoft Montreal CEO Yannis Mallat hinted that the company was open to reviving Splinter Cell and working with the dormant franchise again. Splinter Cell hasn’t seen a release since Blacklist back in 2013. The timing of Ironside being present in the studio two years ago would line up pretty well with a release this year if the evidence is indeed correct. Ubisoft is taking another year off from Assassin’s Creed, and Splinter Cell 2018 would be a great game to fill that gap, though chances are high that the game won’t simply be called Tom Clancy’s Splinter Cell 2018. If the leak is real, it probably means that Ubisoft is gearing up to announce the game pretty soon and open up the doors for Amazon preorders. Retailers have been notorious for leaking games by listing them earlier than intended, and a number of games have been leaked by Amazon themselves. Earlier this year, Call of Duty: Black Ops 4 was leaked by listings for merchandise in GameStop’s system. Do you think it’s time for Splinter Cell to happen again? What do you think Splinter Cell 2018 will be called if Ubisoft does indeed announce it? Let us know your thoughts on this rumor in the comments below.